The evidence of past bucket-line dredging operations can be found in mining districts all throughout the west. These dredges were nothing like the modern suction dredge that we use today; bucket-line dredges were massive floating pieces of mining equipment that churned up the valley floors in many gold rich areas and processed the gravels. Many of these huge dredges could process over 1000 yards of material per day, and they found a whole lot of gold in the process. Here in the U.S., they were used from the late 1800’s through the mid 1900’s. There aren’t any dredges like this being used today, but the remnants of their work is clearly visible throughout many of the richest gold districts. They worked by shoveling gravel up in bathtub-sized buckets, where it was processed within the dredge. To get an idea of scale, most dredges employed an entire crew of men, who worked inside of the huge dredges. The gravels were processed using standard gravity based methods, and the waste material was discarded out of the back of the dredge into tailing piles. Finding areas that have been dredged is not hard to do. Their tailings are easily recognizable by the large, uniform piles of gravel and rock that they left behind. Most dredges worked areas for many miles, so these places are not hard to spot. Historic dredge tailings can be found throughout California, Idaho, Oregon, Montana, Alaska, and most other western states in places where there was enough water to operate them. There is plenty of gold that was left behind in these tailing piles awaiting discovery. Sometimes beginners assume that since this ground has already been mined then there is not any gold left in the ground. Experienced gold prospectors know better. No gold mining method is 100% efficient, and this is most certainly true of the old methods used the early miners. On the old bucket-line dredges, there are two main reasons for this. The first reason is just the general fact the jigs and sluices used inside these dredges weren’t perfect. Anything that is processing that much material in such a short amount of time is going to have losses. Clays could easily trap fine gold and small nuggets, allowing them to roll right out the back of a sluice. The same could be said for specimen gold that just wasn’t heavy enough to be captured. In areas that commonly produce gold mixed within quartz, the specific gravity of these pieces was often not high enough to get caught. For example, a 5-ounce piece of quartz that contains ½-ounce of gold could very easily roll right through a sluice box because the total weight of the quartz piece was not heavy enough to catch behind the riffles. The second and possibly most exciting reason was that the dredges were set up with screens to filter out larger material and rocks. Think about it: These old dredges were continuously moving tons of material, digging up valley floors that included everything from large boulders, willows and shrubs, old tree roots, and all sorts of stuff. Running large material like this through the sluices would be a serious problem. It would clog up the workings of the dredge and not allow them to operate properly. And since gold is generally very small, there was no need to run all of this material. To fix this, they had a screen/grizzly setup that would filter out the big stuff, and only process the smaller gravels. These screens varied in size, but most were around ¾” to 1” in size. Thus, a big nugget or specimen that was over 1” in diameter would get filtered out and not even be processed by the dredge! The dredge operators knew that this was happening, but on a commercial scale it just didn’t make sense for them to process the bigger material on the rare occasion that they would find those large nuggets. It was more efficient to process thousands of yards of smaller material, and accept that they were losing some of large nuggets that only make up a very small percentage of total gold recovery. For us modern gold prospectors, this is a very exciting thought! There are dredge tailing all across the west that contain some HUGE nuggets and specimens that are still waiting to be unearthed. This is not theory, this is a fact. Some seriously nice nuggets are being found every year in these old dredge tailings. Of course just because the gold is out there, it certainly doesn’t mean that it is common or easy to find. If you are searching for a big gold nugget in dredge tailings, the best tool for the job is a metal detector. With a metal detector you can cover a lot of area, unlike other types of equipment where you are limited to a small area to search. 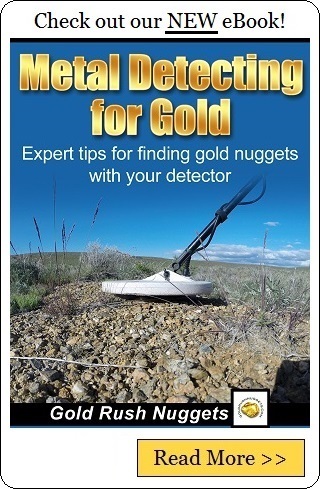 That is not to say that you can’t use any method you want to, but if you are specifically seeking out that once-in-a-lifetime gold nugget, then a good metal detector is probably your best option. With all this talk about big nuggets in dredge tailings, it all sounds simple, right? You go out there with a metal detector and start digging up gold. Well, unfortunately there is one serious challenge with metal detecting in old dredge tailings… trash! Most dredge tailings are absolutely littered with iron trash, from square nails and boot tacks, all the way up to 55-gallon oil drums! The old-timers just didn’t give much thought to littering, and it is clearly evident once you start swinging your detector across some tailing piles. Another issue that compounds the problem is that many dredge tailing were worked and reworked again by the dredges. Guess what happened to a metal can when it was processed through a dredge? It was smashed up, torn apart, and discarded once again into the tailing piles, except now it is in pieces! And 100 years later, an old metal gas can or oil drum has likely been turned into hundreds of little iron bits scattered throughout the areas. Needless to say, finding the gold amongst all this trash is a serious undertaking. So there you have it… the good and the bad when it comes to metal detecting for gold in old dredge tailings. I wish there was some secret to how to hunt them, but the truth is that you are going to have to dig a LOT of trash targets if you decide to explore these areas. On the plus side, there is definitely gold that was left behind, and other prospectors often get easily frustrated with trash and do not hunt the dredge piles. So with some serious persistence there are still some really nice nuggets left to be found. Use a good metal detector that has some sort of discrimination. The old saying of “dig every target” just doesn’t apply here. You could literally dig thousands of metal bits before digging any gold. If an area is extremely trashy, you have to have some way of separating the good sounds from the bad. This doesn’t mean that aren’t going to dig your fair share of trash. To the contrary, you are still going to dig piles of iron rubbish. That is just part of metal detecting. However, to efficiently work an area that is extremely trashy, you need to be able to avoid some of the bad targets so you can spend your time being productive. Another thing worth mentioning is that you MUST do your research and be sure that the area that you are hunting has the potential to produce large nuggets. The appeal of hunting old tailing piles for large nuggets only applies if they actually occur there! Many areas that were dredged produced large nuggets and specimens, but some areas produced only fine gold and small nuggets. Research is always an important part of successful gold prospecting, and this is especially true if you are hunting dredge tailings. If you are going to suffer through and endure all those trash targets, you want to know that there is at least the possibility of a good payoff. If the area doesn’t produce large nuggets, then metal detecting is probably not the best option and you may be better off using other mining methods, or finding a more productive area.